Bloody F. Mess started his musical career right here in Peoria’s punk rock scene in 1983 with his first band, Chips Patroll. Then he formed Bloody Mess & Hate and in 1988 Bloody Mess & The Skabs started a long punk rock run in and beyond Peoria, Illinois. 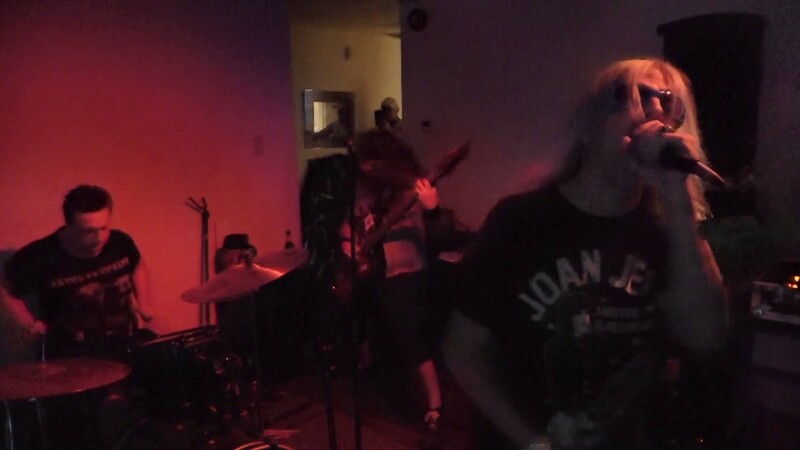 Bloody quit the band in 1994 and went from the punk rock scene to the outlaw country world with two bands, Bloody & The Country Trash Punks and Renegade. Other bands have followed including Bloody & The Vaynes, Bloody & The Transfusions, Bloody Mess & The New Disease and Bloody & The Backstabbers. In addition to making music in those various bands, Bloody became a radio host in 1999 with his Sunday night show, “The Church of Rock” and his radio name is the Reverend Derek Moody. Bloody now lives in Oregon and The Church of Rock is live every Sunday night on KSKQ radio out of Ashland Oregon. You can hear the show, which is co-hosted by Sister Tracy McCloud every Sunday night by clicking here: The Church of Rock on KSKQ Radio. Check out the facecrack page here. You can hear past interviews at their YouTube channel right here. Bloody’s latest band is called, Divine Dirt and they just released their debut album titled, From The Underground. The members of Divine Dirt are: Bloody F. Mess, Lead Vocals; Andy “The Ambassador” Friend, Lead Guitar; David Vallee, bass and Jesse Lee, Drums. The album’s title was inspired by a conversation Bloody had with Baba Bhagavan Das, where he realized that Bloody had spent a good portion of his life in the underworld. Bloody has become very involved in Hinduism and Buddhism and the lyrics on the album reflect these beliefs. The music is blistering hard-hitting rock ‘n roll at its finest. The band is introduced on the fantastic opening instrumental number, “From The Underworld.” Then Bloody F. Mess comes to the front and center with his snarling, powerful and melodic vocals on the tune “Divine Dirt.” The lyrics to the songs, written by Bloody are not your normal hard rock/punk words and phrases. There’s nods and references to his Hindu and Buddhist beliefs which make for interesting listening, sort of enlightened high energy rock ‘n roll. 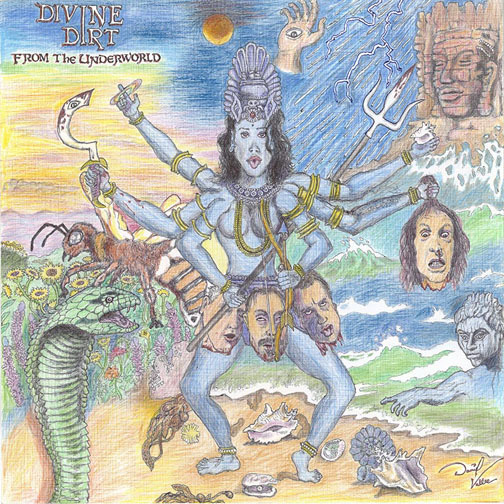 In addition to the four members of Divine Dirt, there’s also a slew of guest stars playing and singing on the album including: Rikk Agnew, Gitane Demone, Casey Royer, Felix Alanis, Hellin Killer, Paul Roessler and Tracy McCloud. Lots of inspirations can be heard in these tunes ranging from The Ramones to Alice Cooper to Black Sabbath but in the end, they sound like Divine Dirt and that’s a beautiful noise they’re throwing out at the universe! You can get a copy of the debut CD by Divine Dirt at CD Baby, or you can email Bloody and he’ll personally send you one and maybe even autograph it if you ask nicely! Click here to email Bloody F. Mess. Divine Dirt will be on tour in April and yes, they are going to be playing in Peoria! Stay tuned to find out the exact date when it’s announced. Related Post: Bloody F. Mess: My History In Peoria And Beyond.